Below are listed the most amazing natural and man made landmarks of Kyrgyzstan. Jeti-Ögüz Rocks – Issyk-Kul. Gorge with interesting cliffs, such as the group of cliffs called "Seven Bulls". Suluu-Terek Canyon – Chuy and Issyk-Kul. Impressive canyons with tall, picturesque cliffs. Chil Ustin Caves (Chil Ustun) – Osh. 380 m long cave which is adorned with stalactites and crystals. On the walls of cave are ancient inscriptions, also in Sanskrit. Some crystals emit sound when wind is blowing. Kan-I-Gut Cave – Batken. Long cave with amazing speleothems, including up to 6 m tall gypsum "chandeliers". In the 10th and 11th centuries and also later this cave was important mine of silver. There are many stories about hidden treasure. Recently investigated part of the cave is 3.5 km long but there are stories that cave is more than 30 km long – some name even 300 km. Abshir Ata Falls and Abshir Say Gorge – Osh. Abshir Say river starts with a waterfall which comes out from the cave. This waterfall is some 30 m tall and many locals believe that its water has curative properties. Arslanbob Great Falls (Arslan Bob Fals) – Jalal-Abad. Tall waterfall which slides down along nearly vertical cliff face. One cascade is 60 m tall, other – 80 m tall. 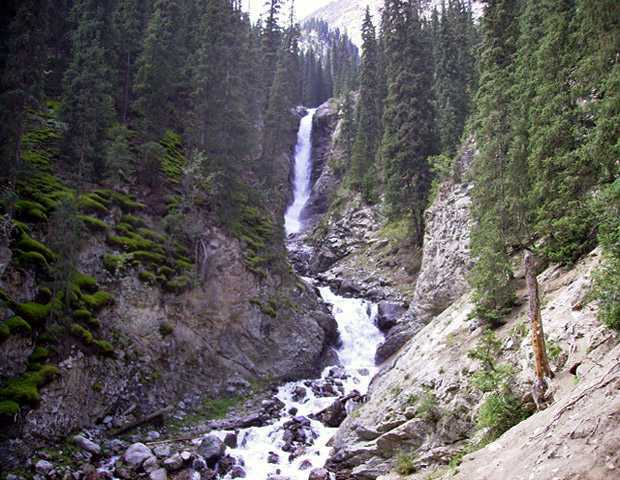 Barskoon Falls – Issyk-Kul. Group of several waterfalls which are up to 24 m tall. Sokuluk Falls – Chuy. Approximately 60 m tall waterfall with a single, impressive leap. Arslanbob Forest – Jalal-Abad. Large forest of wild walnut (Juglans regia), the main genetic pool of walnuts. Alexander the Great took walnuts from this forest to Europe. This is world’s largest walnut forest with an approximate area of 11,000 ha. Here grow other species of rare fruit trees too. Merzbacher Lake – Issyk-Kul. This lake has formed on a glacier and consists of two parts – upper and lower. Lake formed in the 19th century and twice per year – in summer and in winter the lower part flows away. This outburst causes floods and flow rate may exceed 1,000 m³ per second. Ak Chukur Cave – Issyk-Kul. Cave with prehistoric cave paintings. 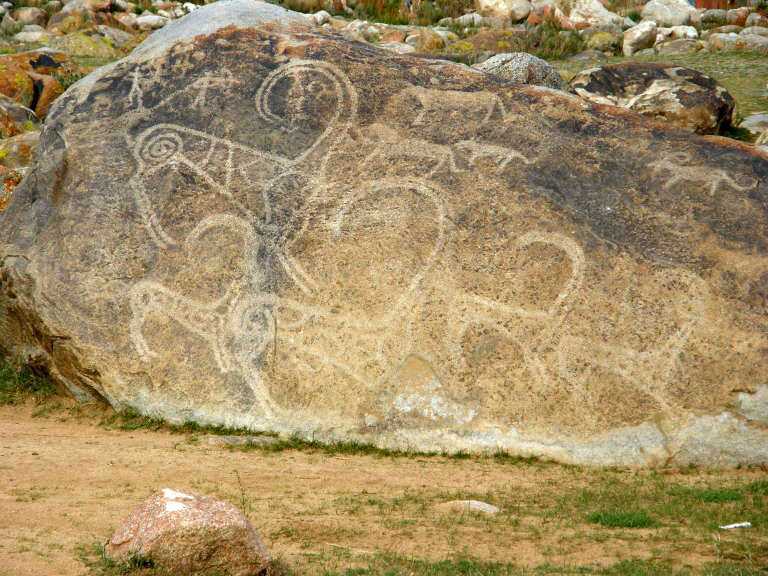 Cholpon-Ata petroglyphs – Issyk-Kul. Numerous boulders on a slope of valley which have been adorned with some 2,000 petroglyphs in the time period from 800 BC to 1200 AD. Katvan Cave – Batken. Cave with prehistoric cave paintings. Saimaly-Tash petroglyphs (Saimaluu Tash) – Jalal-Abad. Rich find of prehistoric petroglyphs with more than 10,000 known drawings. It is estimated that these petroglyphs were made in the time period from 2000 BC to the Middle Ages. For most of the year this site is covered with snow. Burana balbals – Chuy. Group of approximately 1 m tall stone statues with carved human faces. These statues were made and erected over the grave sites around the 6th century AD. Now a group of balbals is collected from whole country and placed near Burana Tower. East Song Köl Balbal – Naryn. Stone sculpture – balbal, which seems to be in its original location, at an ancient grave. This stone was made and erected sometimes in the 6th – 10th century AD. Nevakhet (Krasnaya Rechka) – Chuy. 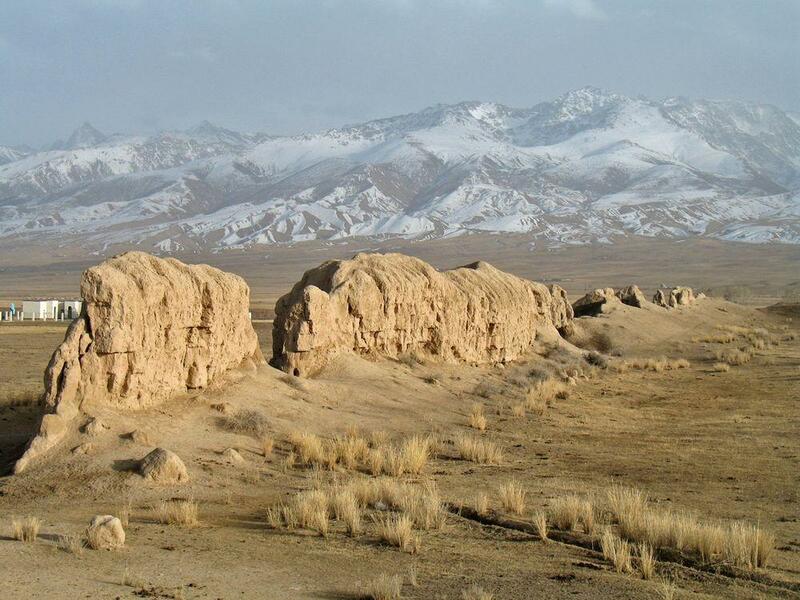 Remnants of ancient Silk Road City which was built by Sogdians in the 8th – 12th century AD. This was multicultural city with Buddhist, Christian, Islamic and Zoroastrian shrines. Shorobashat – Osh. Remnants of an ancient fortified settlement. Its fortification wall is up to 6 m tall and encloses large (approximately 70 ha) area which is divided into four parts. City flourished in the 4th – 1st century BC. Suyab (Ak-Beshim) – Chuy. Ruins of an ancient Silk Road city which developed as a Sogdian trade city in the 5th or 6th century AD. Remnants of city cover some 30 ha and include remains of Christian, Buddhist and Zoroastrian shrines, Chinese fortifications, here were found also steles – Turkic balbals. Uzgen – Osh. Historical city, former capital of Karakhanids. First mentioned in the 2nd century BC. Here are located several ornate buildings from the 11th – 12th centuries – three mausoleums and one minaret. Koshoi Korgon (Qoshoy Qorgon) – Naryn. Ruins of an ancient fortress which most likely was built around the 9th – 12th century AD. Remnants of 4 – 8 m tall walls enclose 250 by 245 m large area. Shyrdakbek – Naryn. Ruins of an ancient fortress – possible headquarters of local rulers in the 9th – early 13th centuries AD. 6 m high walls enclose area which is 120 by 117 m large. Burana Tower – Chuy. 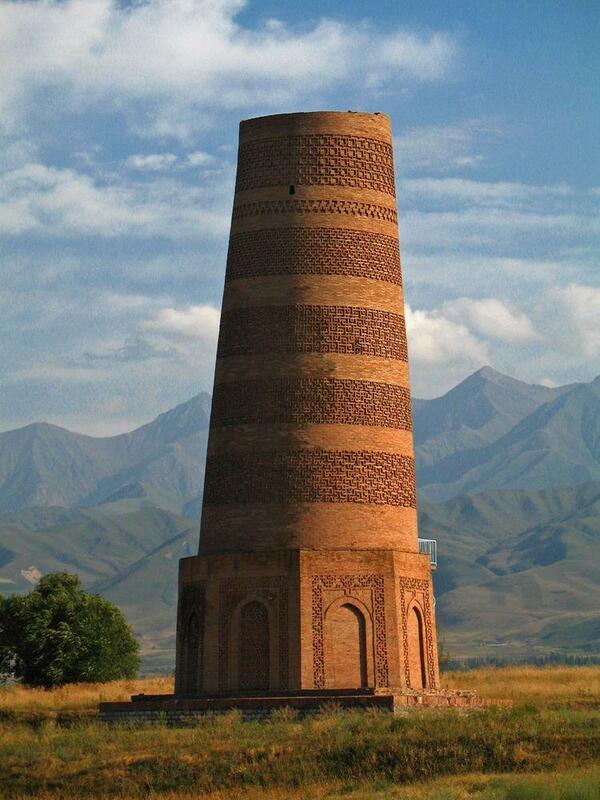 Impressive minaret in the ancient, ruined city of Balasagun (former capital of Kara-Khanid Khanate), which was built in the 11th century AD. Originally this tower was 45 m high but earthquake partly ruined it and now this tower is 25 m tall. Karakol Mosque – Issyk-Kul. Ornate mosque, built by Dungans in 1910. Shakh Fazil – Jalal-Abad. Sacred Islamic site, pilgrimage site. Main site here is the Tomb of Shah Fadl, probably built in the time period between 1050 and 1060 AD. Some other important buildings are here, e.g. Safed-Bulan Mausoleum, Alamberdar Mausoleum and stone steles. Sulayman-Too Sacred Mountain (Taht-I-Suleiman) – Osh City. Ancient sacred mountain which is worshiped for several millenia. Now it is Muslim pilgrimage destination. According to legends here is located burial of prophet Sulayman. On the tallest summit is mosque, which was built in 1510, there is one more mosque from the 16th century as well as caves with petroglyphs. Karakol St. Trinity Orthodox Church – Issyk-Kul. Large wooden church with interesting architecture, built in 1895. Manakeldy – Naryn. Medieval caravanserai at the altitude of 2,500 m, was actively used in the 10th – 12th centuries. Manas Ordo – Talas. Park with museum and Manas’s Kümböz – ornate medieval building – mausoleum where supposedly has been buried Kyrgyz national hero Manas. This Karakhanid-era structure was built sometimes around 1334. Tash Rabat – Naryn. Medieval caravanserai at the altitude of 3,200 m, built in the 15th century. Initially in the 10th century here was built Nestorian monastery. 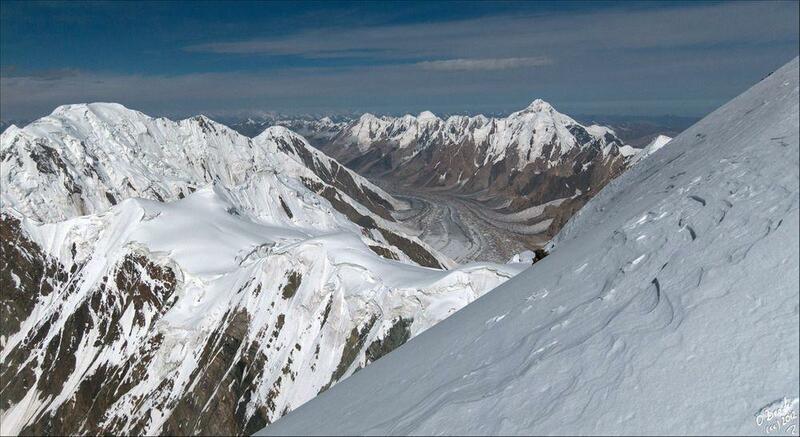 Kyrgyzstan is landlocked mountain country with impressive scenery. Most interesting landmarks of Kyrgyzstan are linked to its past, especially to the ancient and medieval times when Silk Road through the country was in active use. Here are found abandoned cities and fortresses, high up in the mountains are caravanserais – ancient shelters for travellers, thousands of prehistoric and ancient petroglyphs are found near mountain passes and elsewhere. 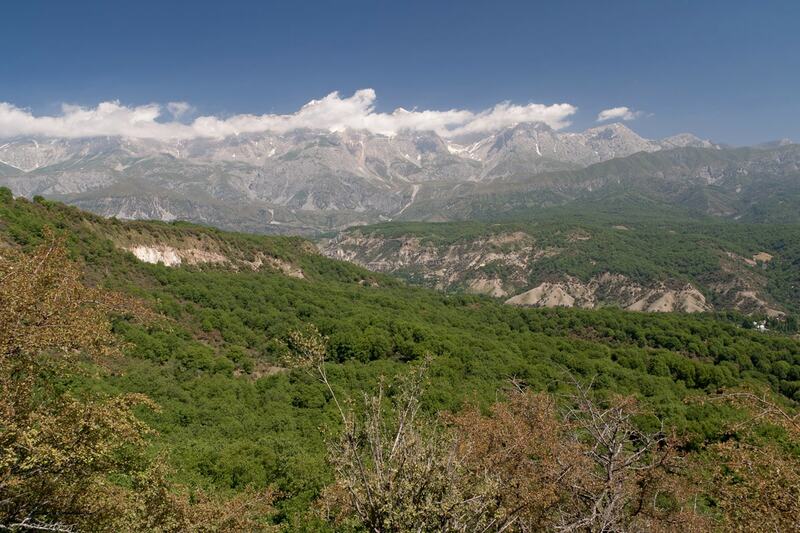 World’s largest walnut forest – Arslanbob Forest – is located in the mountains of Kyrgyzstan. Each year there are collected some 1,500 tons of walnuts thus making this forest the largest single source of these nuts in the world. One of the most beautiful countries in the world, Kyrgyzstan has it all: glorious mountain scenery, a rich nomadic tradition, Silk Road monuments and thrilling wildlife. Author and seasoned traveler Laurence Mitchell is an expert in the country and in this fully updated edition details all the services and experiences on offer, including trekking, mountaineering, horse riding, historical sites, festivals and Kyrgyz culture. Mary and Tracy Atwood moved with their three teenage children to Bishkek, Kyrgyzstan in the fall of 1999. This memoir describes the joys and challenges of expatriate family life in Kyrgyzstan. Formal education had to continue in some way, and new languages had to be learned. A few hardships had to be endured, but they were largely overshadowed by the opportunity to know people of two different cultures. Go with the family as they are guests in various Kyrgyz and Russian homes.